Is your vacuum's hose damaged or broken? Want to spend less but retain quality in your purchase? Thi.. Compatible replacement lower duct hose for Dyson DC24 vacuum cleaner models. 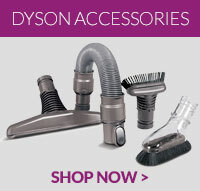 ..
Genuine Dyson lower duct hose for Dyson DC24 vacuum cleaners. A split or faulty hose can seriously a..
Genuine Dyson replacement wand handle cap in Silver for Dyson DC24 vacuum cleaners. .. This wand handle is a genuine spare part for your Dyson DC24 vacuum cleaner .. This item is a genuine spare part for your Dyson DC24 vacuum cleaner ..